Chic Timex model in PVD gold plating and black leather. The white dial is set with numeral hour markers and slender hands. Arrived within 24 hours. Looks good. Plain face but easy to see in daylight and the dark. Bought as a xmas gift so unable to comment any further. More than satisfied with purchase. Top quality watch.Nice and clear face excellent to see in the dark ,great service quick delivery and brilliant price. Does what it says on the tin. Easy to read. A good looking watch, bought as a spare when my Casio EQB-500 hiccuped. Arrived on time. Looks good. As described. Too new to comment on quality. This was a replacement Indiglo watch. They are wonderful, value watches that can sit on your bedside table and light up when you dont want to wake up a partner. It is really too soon to review a watch, however, the watch looks good, is easy to read and has a useful backlight. I cannot comment on its accuracy or durability as I havent had it very long. If you like watches that give you 5 different time zones, a depth meter and a stop watch, then this watch isnt for you. 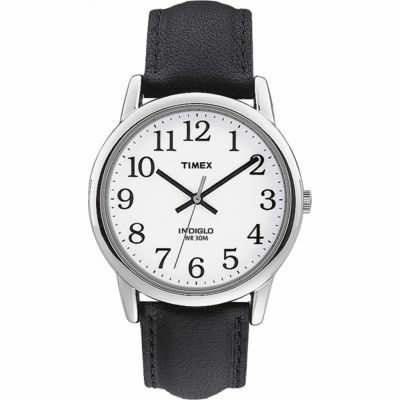 If like me you just want a clear dial, with no fuss but a classic look then buy this item. Plus it has a push button light which is very handy. Watch exactly as expected, very fast delivery, completely satisfied. I purchased this to replace a previous timex indiglo which had a cracked glass and flat battery ! The cost if replacing those would be very nearly as much as a replacement at the price offered. I like the watch because its so easy to find out the time during the night or in poor light conditions. This product is really good value for money. The timex indiglo watch was in exellent condition on its arrival.very pleased with my purchase. Big face, big numbers, lights up in the dark, leather strap. Delivered within 40 hours of placing my order on line. Whats not too like?! Second one bought and as good as ever. Brilliant at night when one wants to see time . Bought for my husband for Fathers Day. Very pleased especially with the lighting up button for nights or darker days. Good clear easy to read face. Bought one of these in the USA over twenty years ago and until a few weeks ago it kept perfect time. About a year ago the Indiglo feature stopped working ... so thought the time had now come to treat myself to a new one! It has a nice clear face with very clear numerals - means I dont need my reading glasses to see the time! I have worn this watch for over 12 months having bought it to use on holiday to tell the time if I woke up at night to use the back light. The watch is clear and easily read without glasses from over 5 feet away and I have just purchased another for my mother-in-law who is registered blind, but can see this dial. I hope this second purchase lives up to the original, Im sure it will. I need a watch I can read quickly at any time of day or night. Black hands on a simple white face and the Indiglo feature make this watch ideal. What else does a watch need to do? It looks good too.